A global phosphoproteomic analysis identified 7117 phosphopeptides in skin cells exposed to 0, 2, and 50 cGy of ionizing radiation. Statistical analysis was used to identify 286 2-cGy phosphopeptides (on 233 proteins) and 245 50-cGy phosphopeptides (on 187 proteins) that were apparently altered compared to 0 cGy treated cells. Bioinformatic analysis of the 2- and 50-cGy affected proteins suggests that low- and high-dose ionizing radiation affect different biological processes. Shown are the log p values for each dose group, with the dashed line indicating statistical significance (p=0.05) identified using the DAVID web portal. In the most comprehensive analysis of its type published to date, scientists at Pacific Northwest National Laboratory have found that exposing human skin tissue cells, or fibroblasts, to low doses of ionizing radiation regulates phosphorylation of proteins that are involved in a wide range of biological processes. In short, the body can sense low doses of radiation and activate the cell signaling pathways needed to respond to any induced cellular damage. The research team, led by Dr. Feng Yang and Dr. David Stenoien, identified a number of proteins associated with radiation responses and DNA damage repair 1 hour after being exposed to a small dose of radiation, 2 and 50 centiGray (cGy), or about the equivalent of a dental X-ray. The gray is the SI unit of absorbed radiation dose caused by X-rays or other types of ionizing radiation. One cGy is 10-2 Gy. Prominent among the proteins identified is one that plays an important role in DNA damage recognition. This protein is called p53 binding protein 1 (53BP1). The study shows that 53BP1 gains a cluster of phosphate and oxygen atoms at both low and high doses. Scientists believe this phosphate addition could either recruit DNA proteins repair or cause DNA damage. High doses of ionizing radiation, such as those from nuclear fallout, result in biological damage and increased cancer risk. But the precise relationships between long-term health effects, including cancer, and low-dose exposures, such as those from radon and medical procedures, remain poorly understood because any increased cancer risk is too small to measure in a very high background of naturally occurring cancers. In fact, such relationships are currently extrapolated using high-dose exposure data. The data presented in this study indicate that a subset of the proteins and signaling pathways are differentially regulated at low and high doses. This indicates that extrapolating disease risk linearly from high to low doses may not accurately assess the actual risks of low-dose exposures. The researchers employed a unique capability at the Environmental Molecular Sciences Laboratory (EMSL) using phosphoproteomics to map changes in post-translational modifications on thousands of proteins that occur following exposure to low-dose radiation. Those phosphoproteins showing statistically significant changes following radiation exposure were analyzed using bioinformatic methods to identify the signaling pathways and biological processes affected by radiation. The results provide a basis for the systems-level identification of biological processes, molecular pathways, and individual proteins regulated in a dose-dependent manner by ionizing radiation. 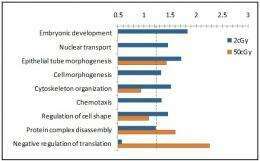 Further study of these modified proteins and affected networks should help to define the molecular mechanisms that regulate biological responses to radiation at different radiation doses and clarify the impact of low-dose radiation exposure on human health.